The last time I did a wso was February 2012. I had partnered with Derrick Van Dyke to offer WP Optins", the Viral List Building Plugin for WordPress. It all started when I needed an easy way to create amazing squeeze pages and back then, nothing filled the bill. So as soon as I had come up with the idea for a squeeze page maker, as a WP plugin, Derrick was on the spot. He was eager to create the software for me. Why was Derrick Eager He had been making all my squeeze pages and of course, he was happy to have a way out. At last, I could make my own squeeze pages and Derrick didn't have to stop what he was doing and make them for me any longer. It was awesome! Because, out of that experience and three years later, came my new product called, The Five Steps To Profit". But it didn't solidify until Derrick led me to write a report about my success. He made me realize that I knew enough to do it. It turned out that my success story came from the exact system that I used all along. I simply wrote it out. Karin has done a good job in outlining her 5 Steps To Profit. She covers important points, such as developing the right mindset, choosing the most profitable niche; and making sure the solution you present for the problem you are addressing is proven to work for YOU; and is not theory based. Her personal example displays perfectly how to approach this method, and is a welcome inclusion in the guide. The Bonus section also has some good tips to help your business grow. All in all, a solid report, and will make a great WSO!" This 23 page product is concise and to the point, explaining what a 'newbie' needs to know to start their own sustainable online business. Well written and an easy read, Karin shows how anyone, whatever their age can easily create their own product and make money. I loved the fact that she doesn't teach the old 'only write what you know about' but advises a different tactic. A great product that can help anyone who is serious about making money online. Karin crams a lot of useful information into her 23-page report. It's easy to see that her lengthy past experience as a teacher has automatically ensured her report has been done in an easy-to-read and structured way. Those 23 pages give us a concise history of Karin's Internet journey from newbie to accomplished marketer. Having a mentor (her son in Karin's case) from the beginning must surely be a great short-cut for anyone's learning curve online. So many of us skip that phase in the beginning, learning only after stumbling and falling on our faces and being ripped off a few times before moving in the right direction. Karin gives the reader a number of precise steps to take to achieve success with a first product creation. She emphasizes not to skim over those steps, instead to religiously follow them for successful implementation. It's not all theory, by the way, as she backs up what she says with a good, personal example so you can see how everything works. This example is quite inspiring, I found, especially as she quit her well-paying job cold turkey to take on her Internet journey. She doesn't tell you to do that, but does suggest things to consider. Karin offers you a blueprint for niche selection, giving you suggestions for hot topics to choose from and stressing the need to stick with her guidelines. These guidelines are followed by precise step-by-step details on how to formulate a successful product that will meet buyers needs. Karin's online journey basically progressed through seeking a solution to a problem she had. She found a solution, applied it to her business, and then finally offered it to the public as a possible solution to their problems. She has never looked back, it seems. The report is inspiring reading and useful information for others to digest, particularly newbies as they start on their online journey. 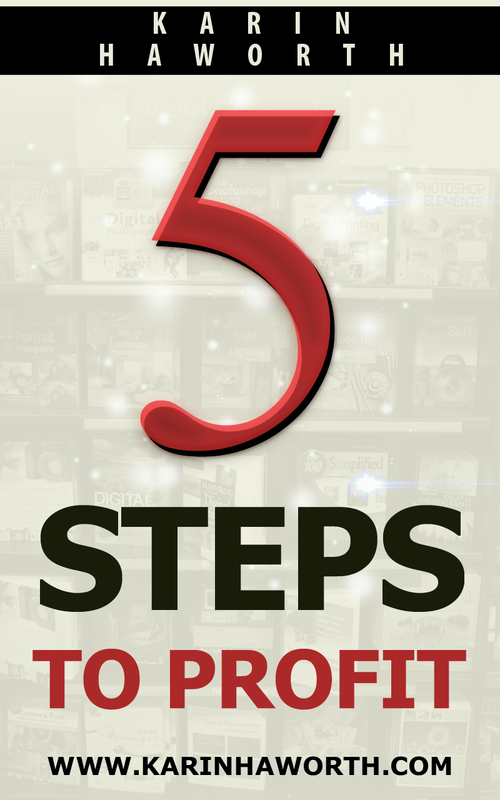 5 Steps To Profit" by Karin Haworth is a 23 page report that details her journey with internet marketing. Karin's report gives good advice for any newbie marketer who wants to quit their job and succeed online. This course shows you how to start your online business by creating and promoting a product. Karin explains internet marketing in 5 simple steps. By learning and understanding these 5 steps, I believe anyone can start their journey on creating a successful business online. Newbie marketers are at a disadvantage today because they are inundated with so much advice, products and courses, that they become overloaded. Confusion seems to be the norm for many. To alleviate the confusion most buy another shiny object and then another. Karin's report is all about K.I.S.S. (Keep It Simple Stupid!). I believe you need to listen to her. Don't over-complicate it. As many have said, This ain't Rocket Science"! Karin finishes up the report with a case study about her own online adventure. She tells you how she started, was mentored and finally created her own successful product, out of a need she experienced, using the knowledge she learned. Karin Haworth's, 5 Steps To Profit" was an enjoyable read. If you are a new marketer, I am certain you will gleam a thing or two that will help you succeed with your new career. Thank you Karin for allowing me to review The Five Steps To Profit". In 23 no-fluff pages, Karin walks you through the steps she took to create an successful online business. Yes she had her son, a successful online marketer, for a mentor, however that doesn't mean she was making gazillions 30 seconds after learning from him. it is the same. You don't want to go into it blindly. You have to set a foundation & Karin walks you through that process. Once you've decided your niche you'll further break it down into what you want to focus on. After that is decided, you're ready for the 5 Steps to Profit. The five steps are explained in an easy to understand manner & then in the last section, she shows you how she applied the steps to explode her business. This is the perfect blueprint for newbies to get started & on the right path! Anyone new to the industry and those who are just simply 'In the Dark' and for way too long. This guide is for folks who are looking for a 'Bare Bones Map' with clear and concise methods laid out. It's for those ready for the work required. begin working full time online. An emphasis on creating the right Foundation, from which to move forward. The System is Proven to work. The Five Steps To Profit" is a PDF guide that provides you with the Truth and Reality of getting from point End of the Old" to point Beginning a New". While there is work to be done, that work is manageable, because there is a mathematical approach to the system. Each element is built upon the one previously established. First this, then that...all the way down the line, Baby. Two ways to quit your 'Old Job". Three critical steps to laying the groundwork for your 'New Job' Online. How this guide works for affiliates and/or folks looking to create their first product. One power packed method to dissolve any hindrance that stands in your way to success. The one thing I learned from the 'Meerkat' on The Lion King". The three Most lucrative Niches. And the # ONE Choice & Why. Does it matter which niche Most experts say, No". The First question to ask before searching the marketplace. Base your choices on these guidelines. Where and how to find the most popular problems and solutions. How to provide the proof that will sell a product. How do you know when a product is ready to sell. Why this one step makes all the difference in your sales.